Sermonti and Casciano (1963) provided the first hints that different fertility types might be represented among strains derived from S. coelicolor A3(2). A subsequent large-scale systematic analysis was carried out (see Hopwood et al. 1973, for a review). Colonies from UV-exposed spores of one strain (number 12, and therefore an early derivative of the wild type) were replicated onto plates spread with untreated spores of mating partners with suitably different genetic markers, to allow growth, mating and sporulation to take place. On a further round of replication to a medium selecting for recombinants, it turned out that about 1% of the colonies of strain 12 gave rise to dramatically increased numbers of recombinants, and were similarly highly fertile in crosses with several other multiply marked strains from the S. coelicolor lineage. These variants of strain 12 were called "ultrafertile" or "UF" (Hopwood et al. 1969). Detailed analysis of the ultrafertile crosses showed that the UF strains derived from strain 12 were in fact super-recipients, and that the partner strains (designated "NF" for "normal fertility") behaved as donors. Not only were the crosses polarised in direction, but the pattern of chromosome donation had changed from that observed in the earliest S. coelicolor crosses: there was a bidirectional gradient of donor marker inheritance among recombinants, centred on the determinant of the NF fertility type. The crosses were indeed astonishingly fertile: nearly all the spores from a well-balanced mating mixture were recombinants, with the donor and recipient genotypes virtually absent. Strain 12, from which the UF strains had been derived, proved to be about ten times less fertile in crosses with NF strains, and these properties, which were shared with the wild type and other direct derivatives from it, defined the IF type (for initial fertility) (Vivian and Hopwood 1970). A subsequent fuller exploration of pairwise crosses between representatives of all three fertility types showed that UF x UF and IF x UF crosses exhibited comparatively low frequencies of chromosomal recombination (Vivian and Hopwood 1970); but, in the IF x UF crosses, strikingly, close to 100% of all those progeny with the UF chromosomal genotype had acquired IF status (Vivian 1971). From such results, it was concluded that IF strains, such as the wild type and strain 12, possessed a self-transmissible plasmid, termed SCP1, which replicated independently of the chromosome and could be lost to give UF strains either spontaneously (from about 0.1% of spores) or, with tenfold higher frequency, after UV irradiation. SCP1 transfer from IF strains was associated, albeit infrequently, with co-transfer of chromosomal DNA. In the NF super-donor strains, SCP1 appeared to have integrated into the chromosome, in a genetically long region otherwise devoid of known genes (this long "silent" region may, at least partially, be attributable to the integrated SCP1 itself, which is about 5% of the length of the chromosome) (Fig. 2). In a successful search for new examples of SCP1 integration, Vivian and Hopwood (1973) and Hopwood and Wright (1976b) isolated further high-frequency donor strains from irradiated spores of the SCP1 + strain 12 (Fig. 2). These differed from NF strains with respect to their stability, apparent point of SCP1 integration (in some cases) and gradient of marker transfer (they appeared to be unidirectional donors), though it was possible to isolate an NF-like bidirectional donor strain (A634) from one of them by a further round of screening (Fig. 2: see also below). Thus, SCP1 appeared to be able to recombine with different regions of the chromosome, perhaps in different configurations to account for unidirectional or bidirectional transfer. 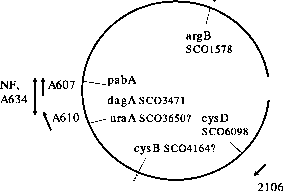 went on to find two autonomously replicating SCP1 derivatives that resembled F' plasmids in carrying genetically identifiable chromosomal markers (cysB and argA-uraB, hence the respective plasmid designations SCPl'-cysB and SCPl'-argA, uraB; Fig. 2). These could mobilise the chromosome, the best characterised (SCPl'-cysB) giving a bidirectional gradient of chromosomal marker transfer that was highest for genes close to cysB. It also proved possible to isolate further derivatives from an SCPl'-cysB-carrying strain in which the plasmid appeared to have integrated fairly stably into the chromosome. 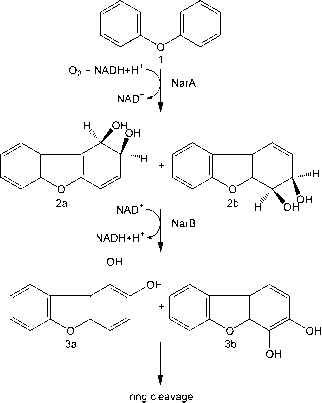 Although these SCPl' strains and their derivatives have yet to be characterised physically, some of the other "new" kinds of donors are revisited later in this chapter, when the molecular basis for their properties is discussed.